When a deputy chief engineer who is passionate about motorsports is put in charge of turning a high-style concept model into a road-ready compact crossover, great things happen. Great things like the 2018 Toyota C-HR – an all-new, coupe-inspired crossover hitting the streets across Canada this spring. The 2018 Toyota C-HR is designed around the theme of “distinctive diamond”, combining style and strength. The C-HR’s exterior is unique in the compact crossover market – combining a coupe-like sporty upper body with a dynamic lower body and powerful stance. The interplay between the main body and prominent wheel flares presents an iconic diamond profile that stands out from the crowd. The face is sharp and powerful, designed to look wider than it is and express the C-HR’s dynamic, urban-friendly performance. The profile emphasizes the C-HR’s agile proportions, with powerful wheel arches housing large 17” alloy wheels – accentuating the vehicle’s sturdy posture and compact cabin. And the rear design, complete with hatch fitted with a lip spoiler and functional top wing, enhances the C-HR’s futuristic look and surprising girth. Open the door, and the C-HR invites drivers into a modern cabin that may appear compact from the outside, but is surprisingly spacious. The interior is a study in contrasts – combining a seamless, expansive space for five adults with a driver’s zone that places the focus on performance. The exterior’s distinctive diamond motif is reinforced inside, through diamond-patterned textures and fittings – from the dual-zone automatic climate controls, to the speaker surrounds and door pulls, to the black headliner above the front row seats. The C-HR’s sports car-inspired dash is angled to provide the driver with a clear view of the road ahead and intuitive access to instrumentation. Bolstered bucket seats keep driver and passengers snug and comfortable during spirited driving. There’s generous headroom and legroom in the rear seats, which are split 60/40 and fold flat for extra cargo-carrying versatility. The C-HR benefits from the Toyota New Global Architecture (TNGA) – Toyota’s state of the art approach to platform and powertrain design. The vehicle takes full advantage of TNGA to deliver sports car-style responsiveness, linearity, and consistency of performance. TNGA confers an inherent low centre of gravity, high strength and body rigidity, and low weight to give the C-HR superior handling, whether one is steering, accelerating or braking. This is further enhanced with a newly-developed MacPherson strut front suspension to help the C-HR’s front end respond quickly and precisely at initial corner turn-in. At the rear, an all-new double-wishbone suspension includes Toyota’s first use of shock absorbers with urethane upper supports to improve passenger comfort, cabin quietness and vehicle agility. As an urban-savvy vehicle, the C-HR’s steering is responsive while its ride quality combines the feedback of a sport-tuned vehicle with the impact absorbing abilities to tame rough pavement. At its core, any fun to drive vehicle needs a strong heart – and the C-HR’s powertrain is built around a punchy 2.0L four cylinder that generates 144 peak horsepower and 139 pound-feet of torque. This engine – new to North America – is enhanced with Toyota’s latest generation of technologies, including Valvematic, which enables continuously variable valve timing to enhance performance and fuel economy. This gives the C-HR a city/highway/combined fuel efficiency rating of just 8.7 / 7.5 / 8.2 L/100km. The engine is mated to an all-new continuously variable transmission (CVT), which features a world-first coaxial two-port oil pump system that modifies oil pressure in response to various driving conditions. This CVT is equipped with a Sport mode which, when engaged, increases the responsiveness of the throttle. It also features a simulated seven-speed Sequential Shiftmatic for manual-like driving fun. As a Toyota, every C-HR comes with an impressive list of safety features as standard. These include Toyota Saftey Sense P – a bundle of advanced safety systems including Pre-Collisions System with Pedestrian Detection function, featuring forward collision warning and automatic emergency braking… Lane Departure Alert with Steering Assist function… Automatic High Beams… and full speed Dynamic Radar Cruise Control. Other features include the six active technologies of the Toyota Star Safety System, 10 standard airbags, hill-start assist control, a backup camera, direct tire pressure monitoring system, and more. 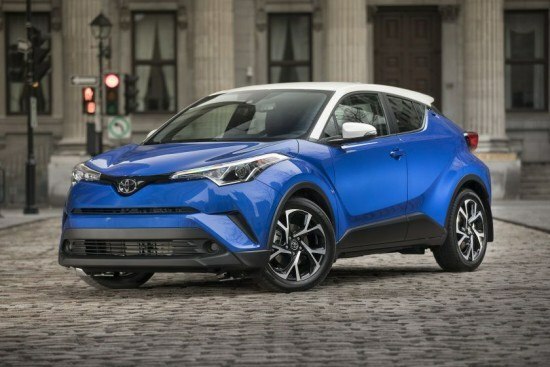 The 2018 Toyota C-HR is offered in one generously equipped trim level – the XLE – which may be further enhanced with an available Premium Package. The XLE trim level (Starting MSRP: $24,690) includes a Display Audio system with 7” screen, Bluetooth® connectivity for portable electronics, voice recognition technology, the Gracenote music database, and steering wheel-mounted audio system controls. Other standard features on the XLE include dual-zone automatic climate control, a 4.2” full colour multi information display, illuminated vanity mirrors, keyless entry, heated front seats, a tilting/telescoping steering column, 17” alloy wheels sporting 215/60R17 tires, power adjustable heated exterior mirrors with integrated signal lamps, LED daytime running lamps, leather-wrapped steering wheel, leather and metal-trimmed shift lever, tonneau cover, and more. The available Premium Package (Starting MSRP: $26,290) replaces the wheels with larger, 18” alloy rims wrapped in 225/50R18 tires, the Toyota Smart Key System with Push Button Start, power folding mirrors with puddle lamps projecting the C-HR logo on the ground, and the additional peace of mind of the Blind Spot Monitor and Rear Cross Traffic Alert safety systems. The 2018 Toyota C-HR can be enhanced by accessorizing to your personality and lifestyle. Accessories to note are Gloss black 18-inch machine spoke Alloy Wheels, the lightweight aluminum Roof Rack, Tub Style All-Season Floor Mats to protect the interior, and Side Window Visors.